A bellow of tubas – and euphoniums, sousaphones and baritone horns. Photos: Karen Widdowson. It’s unclear what the collective noun for multiple tubas might be – a bellow of tubas, perhaps? Or a rumble? But if you were in Civic not long ago you might have been lucky enough to hear the full, spectacular sound that dozens of tubas make when they’re playing Christmas carols. It’s part of a wonderfully cheery worldwide movement called Tuba Christmas. 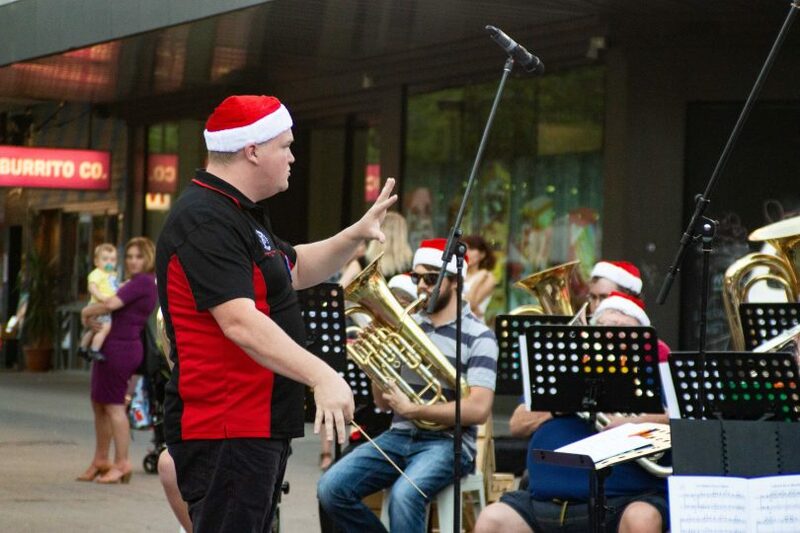 Around 40 musicians entertained the shopping crowds in Petrie Plaza, along City Walk in Civic on December 17, among them RiotACT photographer Karen Widdowson’s dad. Karen was there to capture the footage. Here in the ACT, Canberra Brass took charge of the event. It was directed by Kevin Knapp, who extended the tuba invitation to sousaphones, euphoniums and baritone horns. 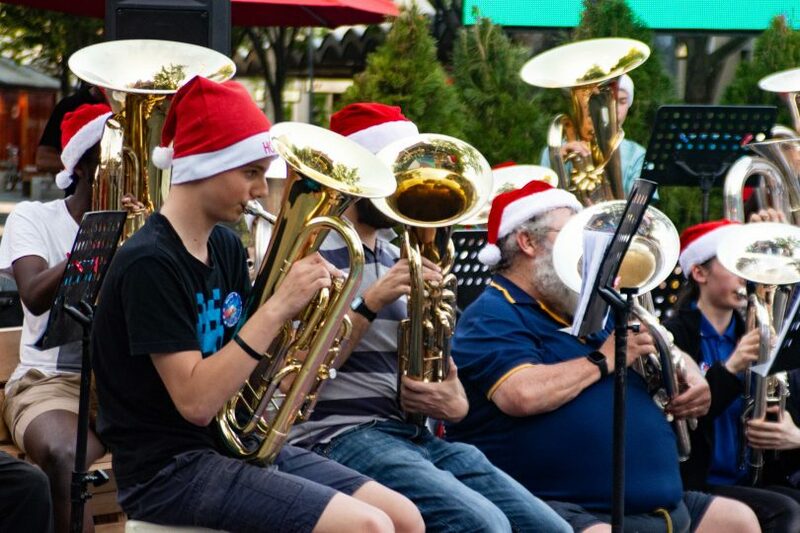 It’s only the second year for Tuba Christmas here in Canberra, but the movement originated in the US where it’s been running for 45 years. And in the US, things can get very noisy indeed: this year’s Tuba Christmas in Kansas City smashed the Guinness World Record for the largest tuba ensemble with 835 performers. The previous record had been over 500 tubas and ensembles of several hundred are not uncommon. The idea began with American musician Harvey Phillips, who wanted to pay tribute to his own tuba teacher who’d been born on Christmas Day. 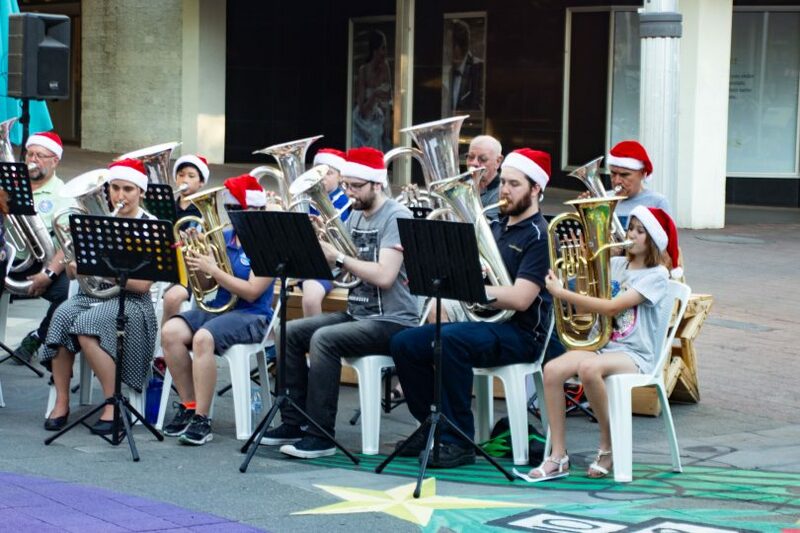 Alongside all the fun of playing huge brass instruments in public, Tuba Christmas also aims to honour music teachers and teaching and to celebrate the camaraderie of musicians playing together. The first Tuba Christmas was conducted in New York City’s Rockefeller Plaza Ice Rink in 1974, and the global event is promoted today by the non-profit Harvey Phillips Foundation, which focuses special attention on musical instruments not ordinarily the object of other support, and works with musicians and composers. Did you hear the tubas playing in Petrie Plaza? Tickets selling fast to A Very Canberra Comedy Festival Christmas!